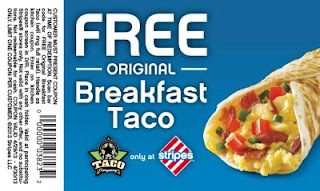 Get a Free Original Breakfast Taco at stripes. Just click the link below to go to the coupon. Print your coupon & take it in to your nearest Stripes to redeem it. This offer is valid from April 29th, 2013 -April 30, 2013.